Each lesson also includes practice pages—models of appropriate texts and reproducible graphic organizers for use with the models. Description: A Preview Map is a drawing of the main features of a textbook page. Begin by explaining to students that seeing a preview helps your brain search for information you already know about a subject. Bringing up background knowledge helps you better understand what you see and hear later. Introductory Activity: Ask students to describe some movie previews they've seen. Pose the following question: What do previews have in common? Tell students to first work in pairs and then in fours, or PODs, to make a list of these traits on the board. Ask groups to make a list of at least five characteristics common to previews. Tell students to think about what a preview is trying to achieve and how it does it. Ask groups to share their ideas. Tell students they are now going to learn how to preview the chapter of a textbook. Step 1: Show a copy or transparency of the chapter opener (Figure 6.1). Ask students to note the main features on this page. Provide a model by pointing out the heading across the top under the section title. Help students see that headings, subheads, graphs, charts, photos, cartoons, maps, and special boxes of texts are all features they should notice. Not available for electronic dissemination. Step 2: Explain to students that they are going to learn how to make a Preview Map of a textbook page. Show a copy of the Preview Map (Figure 6.2) of the chapter opener. Point out to students how this drawing represents the textbook page just seen. Step 3: Point out that all the headings in bold print on the chapter opener are rewritten as questions on the Preview Map. For example, the heading “The Stirrings of Rebellion” becomes “What were the stirrings of rebellion?” Draw lines between sections of text. Step 4: Model how to draw all pictures, maps, graphs, charts, or photos on the blank page to resemble the size and shape of the picture in the textbook. Then write the caption or title of the picture by the shape. Step 5: Now have students use the instructions in the Student Strategy with the opening page of the next section they are about to read in their social studies text and make a Preview Map. Have students also choose one of the Applying the Strategy activities for more practice. Step 1: A Preview Map is a drawing of the features of a page of your textbook. To make a Preview Map, first select one of your texts that you wish to read better. Then turn to the first page of the chapter or section that the class is going to read next. Step 2: You will make a drawing of the features of this page. Use a blank sheet of paper with no lines on it. For all headings in bold print, rewrite them as questions. For example, rewrite the heading “The Stamp Act” to “What is the Stamp Act?” Write these questions on your blank paper in the same position as the corresponding headings appear on the textbook page. Step 3: For all pictures or photos, draw a shape on your blank page that resembles the size and shape of the picture in the textbook. Then copy the title or caption of the picture underneath the shape. Step 4: For all graphs, tables, or charts, make a simple drawing of the graphic on your blank page. Then copy the title or caption of the graphic underneath the drawing. Step 5: Look for any information written in the margins of the text. For example, you may see something like “Vocabulary Tips” or “Real-life Connections.” In the same place on your Preview Map, write a brief description of these features. Step 6: Now share the information you've collected on your Preview Map with a classmate. Revise your map if you've left off something. Reread the questions and the information about any pictures or graphics. As you begin to read this page, use your questions to help you look for information to remember. Make sure you understand the text or pictures you've described on your Preview Map. Choice 1: Preview Maps are helpful in all subject areas, not just social studies. On blank transparency film, make a Preview Map for the opening page of a chapter from each of your textbooks from other classes. Share these maps with the class. Then borrow a textbook from a lower grade. Show a younger student how to make Preview Maps with his or her text. Choice 2: How would you preview one of your textbooks to your classmates? Choose one of your textbooks and study its Table of Contents. What features would you highlight? What would get your classmates excited or interested in this subject? What real-life connections can you see between your text and your world? Create a storyboard, a PowerPoint slide show, or a video no more than a minute long that sells your text to your classmates. Description: The strategy called P.L.A.N. provides a structure to help students organize their reading and reflect on the text in short chunks. Begin by explaining to students that having a plan to do any task makes the work easier and more efficient. This strategy will give them a plan to use when reading their textbooks. Introductory Activity: Tell students to imagine they are going to debate the topic “The War in Iraq.” They will need a plan to do research first. Write The War in Iraq within a rectangle on the blackboard. Ask students to call out major subtopics. As students call out subtopics, add them to your graphic, writing each one within an oval. Illustrate how information is organized by listing additional ideas under appropriate headings. For example, “Weapons of Mass Destruction” may be a subheading. Branching off from this topic may be the subheadings of “dirty bombs,” “anthrax,” and “poisonous gas.” Now model how to note your familiarity with these topics. Place an X by topics that you know something about. As you write the X, say aloud something you know about this topic. Place a question mark by topics about which you know little. State that as you do more research, you'll add information to your chart. Teaching the Strategy of P.L.A.N. Step 1: Tell students that they can use the P.L.A.N. strategy for reading a section of text. Pass out copies of the P.L.A.N. Steps (Figure 6.3). Walk students through the steps, explaining that these are the same steps they just followed with the example of the debate on the war in Iraq. Tell students they are going to practice this strategy in their study of the U.S. Constitution. P—Predict the main ideas. Plot how the ideas are organized in a graphic organizer. L—Locate which of these topics you know something about and which topics you know little about. Place an X by topics about which you already know something. Place a question mark by topics that are unfamiliar to you. A—Add information to your chart as you read. N—Note what you learned by restating and reflecting on the information in your own words. Source: From “PLAN: A Study-Reading Strategy for Informational Text,” by D. Caverly, T. Mandeville, and S. Nicholson, November, 1995, Journal of Adolescent & Adult Literacy, 39(3), pp. 193. Copyright © 1995 by the International Reading Association. www.reading.org. Adapted with permission. Step 2: Show the textbook page titled “What Are Your Rights?” (Figure 6.4). Read the headings and bold words aloud. Tell students that you can now make predictions on your graphic organizer. Step 3: Pass out copies of the partly filled-in graphic organizer on “What Are Your Rights?” (Figure 6.5). Read aloud the headings and bold words that have been filled in. Step 4: Ask students to look at the textbook page. Model for them how to fill in the remaining subheadings and bold words. Place an X by topics you already know something about. Tell students what you know and how you know it. Place a question mark by topics about which you know little. Step 5: As you read this piece aloud, stop after each section and ask the class what new information can now be added to the chart. Add this information. When you have completed the chart, reflect back over your work, noting aloud what you have learned. Step 6: Have students follow the steps in the Student Strategy, including choosing one of the Applying the Strategy activities for more practice and assessment. P—Predict the main ideas and plot how they are organized. L—Locate which of these topics you already know something about and which you know little about. Step 2: Choose a section of a chapter that you are about to read. On a blank sheet of paper, or using the P.L.A.N. handout (Figure 6.6), write the main title or heading within a rectangle in the center of the page. You will now predict and plot how the chapter is organized. Step 3: Copy the bold subheadings from your text in ovals surrounding the square. Begin at the top oval (at 12 o'clock on a clock) and move to the right, or clockwise, filling in the ovals with the subheadings in the order that they appear in your book. Step 4: You are now going to locate known and unknown information. Place one of the following symbols by each oval on your chart: an X means the information is familiar to you; a question mark means that you don't know much about this topic. Step 5: Begin reading each subheading in your text. Add new information to your chart as you read. Add bold words from your text to your chart by the appropriate subheading. Be sure to add information to sections where you placed a question mark. Step 6: Once you've finished reading, note what you have learned. Either try to redraw your P.L.A.N. from memory, rewrite your P.L.A.N. as a learning log in your notebook, or reteach the text to a classmate. Choice 1: P.L.A.N. is helpful in all subject areas, not just social studies. Choose another one of your textbooks. Following the same procedure as above, fill out a P.L.A.N. on the next chapter you are about to read. Share your charts with your teacher for that subject. Choice 2: Imagine you want to do a survey of students about improving your school. Follow the P.L.A.N. steps to predict which major areas you'd like to improve. Locate which of these areas you know something about and which you know little about. Add information to your plan by interviewing classmates, adding what they know. Then note what you've learned by summarizing your survey in a written report or speech. Description: Many students have difficulty determining the main ideas in a section of text. Students may confuse bits of information included to support or enliven the text with main points. Pair Questions and Answers will help students focus on main ideas. Introductory Activity: Find an interesting sports article from either the school or local newspaper. Write the following words on the board: Who? What? Where? When? Why? Tell students you are going to read the article aloud. As you read, they are to see how many of the questions on the board they can answer. After reading, have students give their answers. Tell students that these simple questions can help guide them in determining the essential information in a social studies textbook. Step 1: Explain to students that history is about people and events that create changes. When you are looking for the main point of a section of text, you should ask yourself what this person or event did to change the lives of others. Step 2: Pass out copies of the Pair Questions and Answers graphic (Figure 6.7) and the text page that includes the section “Tools of Protest” (Figure 6.8). Choose a student as your partner as you model the activity. Directions: Use Pair Questions and Answers with a partner to determine the main ideas of the following two sections of text. To protest the Townshend Acts, colonists in Boston announced another boycott of British goods in October 1767. The driving force behind this protest was Samuel Adams, a leader of the Boston Sons of Liberty. Adams urged colonists to continue to resist British control. The boycott spread throughout the colonies. The Sons of Liberty pressured shopkeepers not to sell imported goods. The Daughters of Liberty called on colonists to weave their own cloth and use American products. As a result, trade with Britain fell sharply. Colonial leaders asked for peaceful protests. Articles in the Boston Gazette asked the people to remain calm—“no mobs. . . . Constitutional methods are best.” However, tempers were running high. When customs officers in Boston tried to seize the American merchant ship Liberty, which was carrying smuggled wine, a riot broke out. The rioters forced the customs officers to flee. In the fall of 1768, 1,000 British soldiers (known as redcoats for their bright red jackets) arrived in Boston under the command of General Thomas Gage. With their arrival, tension filled the streets of Boston. Since the soldiers were poorly paid, they hired themselves out as workers, usually at rates lower than those of American workers. Resentment against the redcoats grew. Soldiers and street youths often yelled insults at each other. “Lobsters for sale!” the youth would yell, referring to the soldiers' red coats. “Yankees!” the soldiers jeered. Yankee was supposed to be an insult, but the colonists soon took pride in the name. On March 5, 1770, tensions finally exploded into violence. A group of youths and dockworkers—among them Crispus Attucks—started trading insults in front of the Custom House. A fight broke out, and the soldiers began firing. Attucks and four laborers were killed. The Sons of Liberty called the shooting the Boston Massacre. They said that Attucks and the four others had given their lives for freedom. The incident became a tool for anti-British propaganda in newspaper articles, pamphlets, and posters. The people of Boston were outraged. Meanwhile, the redcoats who had fired the shots were arrested for murder. John Adams, a lawyer and cousin of Samuel Adams, defended them in court. Adams was criticized for taking the case. He replied that the law should be “deaf . . . to the clamors of the populace.” He supported the colonial cause but wanted to show that the colonists followed the rule of law. Adams argued that the soldiers had acted in self-defense. The jury agreed. To many colonists, however, the Boston Massacre would stand as a symbol of British tyranny. Source: From Creating America: A History of the United States, by Jesus Garcia, Winthrop Jordan, Donna Ogle, C. Frederick Risinger, and Joyce Stevos. Copyright © 2002 by McDougal Littell, a division of Houghton Mifflin Company. Reprinted by permission of McDougal Littell, a division of Houghton Mifflin Company. Step 3: First rewrite the heading as “What Were the Tools of Protest?” Explain that your partner will read the text to you. As you listen, you will make notes on a transparency of the Pair Questions and Answers graphic for the class to see. Step 4: When the student begins reading, answer as many of the five questions as you can. Don't worry if you don't get all the information down the first time. Also, tell students you can have more than one answer to any of the questions. For example, under “Who?” include both Samuel Adams and the Sons of Liberty. Step 5: Change places with your partner. This time you will reread the same text and have your student partner add more notes to the transparency. After two readings, you should have most of the five questions answered. Step 6: Demonstrate for the students, by thinking aloud, how you determine the main idea. Focus on the actions of the colonists. Then ask for a volunteer to summarize the main idea of this section of text and write it in the space provided. Step 7: Finally, rewrite the next heading as “What Was the Boston Massacre?” Tell students they will now practice the strategy. Pass out copies of the instructions in the Student Strategy for them to follow as they work. Then have students choose one of the Applying the Strategy activities for more practice and assessment. Step 1: Pair Questions and Answers is an activity to help you figure out the main idea of what you are reading. First, choose a partner with whom you work well. Step 2: Look at the title of this section of the chapter. Rewrite this heading as a question. Step 3: Decide who will read the section first and who will listen and make notes. As one of you reads, the partner should make notes that answer the five questions on the sheet. Don't worry if you don't get them all answered during the first reading. Step 4: When the first reader finishes, review the answers you have so far. Step 5: Now switch roles. The note taker will reread the same section, and the first reader will add more information to the worksheet. Sometimes answers for all five questions may not be in the text. Sometimes you may have more than one answer to a question. Step 6: History is about people and events that create change. When looking for the most important idea of a section of a chapter, ask yourself what this person or event did to change the lives of others. Look back at your notes. Which answer seems to have had the greatest effect on the lives of others? Discuss what you think the most important idea in this section might be. Step 7: In the “Main Idea” section of your worksheet, write one sentence that summarizes the most important idea in this section. Tell why this idea is so important. Step 8: Now rewrite the next heading as a question and read to find the answers. Choice 1: Pair Questions and Answers also works when you are reading fiction, or stories that are made up. Choose a story to read. Because there are no headings, you can skip the section on turning the heading into a question. As you read, make notes that answer the five questions. For a story, rename the “Main Idea” section as “Theme.” The theme of a story is the lesson about life that the story teaches. Choice 2: With a partner, use the Pair Questions and Answers strategy to analyze a news story in your local newspaper. Pick a story on the front page. As one of you reads, notice how quickly you are able to answer most of the questions. Newspaper writers include most of the important information at the beginning of the piece. In this way a reader can find out important points without reading the entire article. More detailed information is included later on in the article for those who wish to find out more. Using this format as a model, write a news story about an event at your school. Description: Many students do not use text features and visual information to preview information and guide their note taking. They simply open a textbook and begin reading. Fluent readers use headings and pictures to organize the information they read. Introductory Activity: Choose a page in your social studies textbook that has headings and at least two different types of visual information, such as pictures, maps, cartoons, graphs, or charts. Ask students to turn to that page and begin reading. After three minutes ask students to close their books and write down what was “on the page.” Ask them to recall the headings or describe any visual information. (Most students will recall only part of the opening paragraph.) Tell them that you are going to model a strategy for using textbook headings and pictures to organize your thinking and your notes. Step 1: Show a copy or a transparency of “Costs of the War” (Figure 6.9), which describes the effects of the American Revolutionary War. Background note about the British staying at Ft. Detroit. Reading History question—Why do you think the Loyalists left the United States? A map showing the postwar boundaries of North America in 1783. (1) How many more deaths did the Americans suffer than the British? (2) What percentage of American deaths occurred in battle? Map note—The Spanish still controlled most of North America. An estimated 25,700 Americans died and 1,400 were missing. The British lost about 10,000. Many people and the government were broke. Loyalists left because they lost their property and were traitors. Many Africans & Native Americans left looking for a better life. Step 3: Explain to students that after they have copied main headings, side notes, and bold words in the left-hand column, they should describe any visual information on the textbook page in the center column of the graphic. Point out how the reader used the titles of the map and chart to help describe the two visual pieces. Also point out how the reader copied the questions from the bottom of the chart to answer later. Step 4: Tell students that now the reader has properly previewed the text by noting the important written and visual information. The reader is ready to move to the right-hand column to begin taking notes and answering questions. Tell students that they may not be able to answer the main heading question until they've finished reading the entire section. Show students how the notes in the right-hand column refer to the questions and pictures in the left and center columns. Step 5: Have students use the directions in the Student Strategy and a blank Three-Column Chart (Figure 6.11) to practice the strategy with another textbook page of their choice. Once students have filled out their charts, have them share their charts in pairs. Choose some of the best examples to share with the entire class. Students should also choose one Applying the Strategy activity as further practice and application of the strategy. Step 1: Three-Column Notes is a strategy that helps you preview the information in a textbook section. The graphic also provides a space for you to organize your notes. Step 2: First get a blank copy of the Three-Column Chart. Review the three column headings. In the left-hand column you will rewrite headings as questions and copy down any bold words in the order that they appear. In the center column you will describe any visual information, such as pictures, cartoons, charts, colored boxes, or graphs. In the right-hand column you will take notes as you read. Step 3: Using the page your teacher shows you, rewrite the first heading as a question in the left-hand column of your graphic. Move down the text page. Copy all bold or key words on your graphic in the order that you find them. Rewrite any additional headings as questions so that you will know what information you are looking for as you read. Step 4: Start again at the top of your textbook section. Now, in the center column of your graphic, describe any visual information in the order that it appears. Read the titles and captions to find out what each visual piece is presenting. Step 5: You are now ready to begin reading. As you read the section, define your key terms in the right-hand column. Also try to answer your headings rewritten as questions. Note how the visual information helps summarize, support, or clarify what you are reading. You now have excellent notes about what you have read. Choice 1: The Three-Column Notes strategy works with other content area textbooks. All students should know how to use this strategy. You are going to teach this strategy to either a younger student or a class at a lower grade. Get permission to borrow the student's or class text. Find out what chapter will be covered next. Create a model of a completed Three-Column Chart for the first section of this text. You can use either a transparency or a PowerPoint slide. Rehearse your presentation with a partner, your teacher, or in front of your class. Then teach your lesson to your student or group. Choice 2: Whenever you do research using the Internet, texts, or magazines, it is important to keep good notes. The Three-Column Chart (Figure 6.12) is ideal for note taking while doing research. Choose a topic you want to know more about or one that has been assigned for a class. As you do your research, fill out a Three-Column Chart for each source. For an Internet article, be sure to note the author and the URL (uniform resource locator, or Web address). Also note the date. For books and magazines, include authors, copyright dates, publishers, and pages. Keeping this detailed information on your charts will save you much work later as you begin writing your research paper. 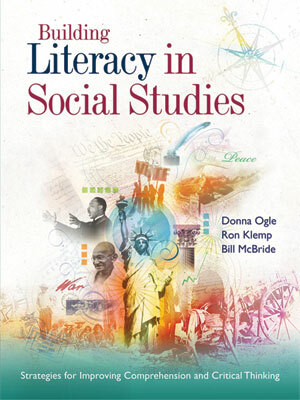 Description: Social studies textbooks, magazines, and newspapers are filled with many types of maps. This activity will explain types of maps to students and show them how to interpret the information they provide. Introductory Activity: Write the following quotation on the board: If you don't know where you're going, you'll probably end up somewhere else. Ask students to write two sentences about what this anonymous quotation means. Students should note that on a literal level, one can get lost; and on a symbolic level, not having a goal in life can leave one subject to the whims of others. Now ask students to draw a map from their house to school or to a major shopping center. Tell them to create symbols for houses, churches, stores, gas stations, restaurants, and their school and to place these symbols in the appropriate places on their maps. Finally, they must write specific directions telling every turn a person would have to make. If possible, have students draw their maps on a transparency. Then have students share their maps and directions with the class. Step 1: Write the following terms on the board: physical maps, political maps, and historical maps. Ask students in pairs or PODs to come up with a one-sentence definition of what they think each of these kinds of maps might show. Help students understand that physical maps show natural features; political maps show boundaries, such as those between towns and countries. Historical maps show events such as battles or migrations. Step 2: Tell students that maps have their own specialized vocabulary. Pass out a copy of Key Map Terms and Features (Figure 6.13). Read aloud the definitions on the page. Compass Rose—a pointer or arrow that shows which direction is north. A large N (for north) is usually placed by the arrow. Inset—a smaller map placed in a corner of the larger map; the smaller map shows exactly where the larger map is located on a larger land mass or area. Labels—words or phrases on the map that explain actions, places, or events. Lines of Latitude—faint lines, often colored light blue, that flow across the map and show how far north or south the area is located. Lines of Longitude—faint lines, often colored light blue, that flow up and down the map and show how far east or west the area is located. Map Key or Legend—a box that shows what lines, colored areas, and symbols (such as stars, arrows, or dots) mean on a map. Scale—a set of bars or lines that show how small distances on the map are equal to actual distances in the real world. For example, a scale may show that 1/2 inch on the map actually equals 100 miles in the real world. The scale is sometimes found inside the Map Key or Legend. Physical Map—shows only natural features, such as mountains, rivers, and lakes. Political Map—shows man-made boundaries, such as states, countries, or towns. Historical Map—shows where and how some major event took place, such as a battle, or how a people spread from one land to another. Step 3: Have students turn to a specific map you have chosen. In pairs or PODs, have students match the definitions on the Key Map Terms and Features sheet to objects on the map. Step 5: Model how to interpret the information on this map by doing a “think-aloud,” stating your thought processes aloud as you think through the map. Step 6: Pass out the sheet Practice with Understanding Maps (Figure 6.14) for more practice. Directions: Use your chart of Key Map Terms and Features to help you answer the following questions about the map below. Answer on a separate sheet of paper. What is the title of the map? Rewrite the title as a question. Is this a physical, political, or historical map? Where is the map key or legend on this map? What six symbols are explained in the map key? Where is the scale on this map? About how many miles does a half inch equal? Where is the compass rose on this map? Where is the inset map on the larger map? What part of the world does this map show? What line of latitude runs through the country of Norway? What line of longitude runs through the country of Italy? What do all the arrows mean on this map? Write an explanation of this map for a younger student. Source: From The Americans, by Gerald A. Danzer, J. Jorge Klor de Alva, Larry S. Krieger, Louis E. Wilson, and Nancy Woloch. Copyright © 2005 by McDougal Littell, a division of Houghton Mifflin Company. All rights reserved. Reprinted by permission of McDougal Littell, a division of Houghton Mifflin Company. Step 1: This lesson will help you learn how to read a map. Choose a map that interests you from your textbook. Look at the title. Which one of the three types below is it? Step 2: Look for any titles or captions on your map. If you find a title in bold print, rephrase it as a question. This will tell you what information to look for in the map. Step 3: Now place your handout of Key Map Terms and Features beside your map. Match the symbols and words on your map to the definitions on your Key Map Terms and Features chart. Step 4: Look for a map key—a box on the map that explains important symbols. Step 5: Look for lines of latitude that flow across the map and lines of longitude that flow up and down the map. These lines are often colored a light blue and divide the map into boxes. The lines will have a number by them. The numbers tell you the location of this specific area on the earth. Step 6: Find the compass rose so that you will know which directions are north, south, east, and west. Find the scale that tells you how to determine the distances on your map. Step 7: Finally, reread all the labels, or words and phrases on your map. With the information you have gathered in the steps above, you are now ready to put it all together and interpret your map. Rehearse with your partner how you will explain the map. Ask the class to turn to the map you've chosen as you explain it. Choice 1: Redraw the map you originally made from your home to your school or to a shopping center. This time include a title, a map key, a compass rose, a scale, and lines of latitude and longitude. Then rewrite your directions but use only the terms north, south, east, and west instead of right and left. Choice 2: Teach a younger student how to understand a map. Find a map in a textbook for a lower grade level. Study the map using the steps above. Think through how you would explain this map. Is there a title? Where would you begin? In what order would you describe the features on the map? Rehearse in your head how to explain the map to another student. Ask the student's teacher if you can teach the class a lesson on understanding maps. Use transparencies or a PowerPoint presentation. Description: Graphs are used frequently in social studies texts and in the media to illustrate information in a visual format. This activity will explain types of graphs and show students how to interpret the information found in them. During the U.S. Civil War, soldiers on the Union, or Northern, side died in the following ways: Accidents—6.4 percent; Prisoners of War—7.7 percent; Combat—28.3 percent; and Disease—57.6 percent. Step 1: Have volunteers draw their graph on the board, explaining how it depicts the information on Civil War casualty percentages. Note that a line graph would not work. Point out that pie graphs can show in percentages how much something is part of a whole. Step 2: Explain that bar graphs compare quantities of things, such as groups, places, events, or categories. For example, you could use a bar graph to compare the number of hot dogs, hamburgers, and bags of popcorn sold at football games in a season. The U.S. Government spent the following sums of money for outer-space activities from 1959 to 1969: 1959—$1 billion; 1961—$1.9 billion; 1963—$5.2 billion; 1965—$7 billion; 1967—$6.8 billion; 1969—$6 billion (Source: NASA). Draw the frame of a line graph on the board and ask pairs or PODs to transfer this information to the graph. When students have finished, have volunteers draw their versions on the board. Step 4: Pass out copies of Practice with Interpreting Graphs (Figure 6.16) for more practice. Use these with the instructions in the Student Strategy section. Also have students choose one of the Applying the Strategy activities for further practice and assessment. Directions: Use your Student Strategy sheet to study each of the graphs on these pages. Then answer the questions about the graphs on a separate sheet of paper. Is this a pie, line, or bar graph? Rewrite the title as a question. What do the figures on the left vertical line, or axis, represent? How many different forms of campaign techniques are being compared? What was the most popular way among young voters to get information? What was the least popular way among young voters to get information? Are these pie, bar, or line graphs? Rewrite the title as a question. What is the difference in the information that the graphs represent? Which presidential candidate did most 18-to-24-year-old voters select? Which presidential candidate did most voters under 30 select? How might the information in these graphs affect each party's actions in the future? What do the numbers along the vertical line, or axis, represent? What do the numbers along the horizontal line, or axis, represent? Why are there two different kinds of lines on the graph? How did the turnout change from 1992 to 2004? Step 1: Graphs are used to compare quantities and to show how things change over time. There are three main forms of graphs—pie graphs, bar graphs, and line graphs. Each is used for a specific purpose. Step 2: When reading any graph, look first for titles or captions. If you find a title, rephrase it as a question. This will tell you what information to look for in the graph. Step 3: Pie graphs show how much something is part of a whole. A “whole” always equals 100 percent. If half, or 50 percent, of the students in your school are female, then half of the pie, or circle, would be filled in to represent females. Step 4: Bar graphs compare quantities of things, such as groups, places, events, or categories. For example, you could use a bar graph to compare the number of Ford, Chevrolet, and Toyota cars sold in a year. Read the captions along the horizontal axis and the vertical axis so that you know what is being compared. Step 5: Line graphs show how something changes over time. Measurements are shown by regular points on both the vertical and horizontal axes. For example, time periods may be listed across the bottom line, or horizontal axis. The vertical line may show percentages or amounts of something. A crooked line within the graph shows how these percentages or amounts changed over time. A line graph may also compare two or more things. Look at the bottom of the graph for a legend, or explanation, that tells what each colored line stands for. For example, a red line might show the math test scores over six months for boys. A blue line might show math test scores over the same six months for girls. Step 6: Finally, find the source of the graph. Where did this information come from? See if you can locate information about the source in the media center or on the Internet. Choice 1: Find out how many of your classmates speak one, two, or three languages. Present this information in the form of a pie graph. Choice 2: Find out how many boys in your class played some kind of organized sport over the last three years. Find out how many girls played in an organized sport over the last three years. Present this information in the form of either a bar graph or a line graph. Description: Charts are used frequently in social studies texts and in the media to illustrate information in a visual format. This activity will help students learn how information is categorized and presented within charts. Step 1: Ask students what the square they have filled out is called (a chart). Show students how charts are useful for organizing information in a simple format that is easier to read than a page of text. Step 2: Explain to students that when reading a chart, they should always begin with the main title, which is usually in bold print at the top of the chart. As with graphs and maps, turning the title into a question will help students know what information to look for in the chart. Step 3: Tell students that charts always have categories. These categories are displayed in columns and rows. Using the chart drawn on the board, make sure students understand the terms column and row. Step 4: Explain that each category has its own heading. Tell students to read the headings next. Step 5: Explain that the categories in charts can contain words, numbers, or pictures. Model for students how to look at the information under one category before moving on to the next column or row. Point out any patterns of organization, such as smallest to largest. Step 6: Now do a “think-aloud,” reflecting on the information presented in the chart and what it might mean. Finally, find the source of the information. Ask if this seems to be a trustworthy source. Step 7: Pass out copies of Practice with Analyzing Charts (Figure 6.17) and the Student Strategy guide in the next section for more practice. Also have students choose one of the Applying the Strategy activities for more practice and assessment. Directions: Use your Student Strategy sheet to study each of the charts on these pages. Then answer the questions about the charts on a separate sheet of paper. What is the title of the chart? Rewrite the title as a question. What does the word federal mean? What are the bold headings in the chart? Which federal employee on the chart serves the shortest term before seeking reelection? Which federal employee can be born anywhere in the world and still serve in office? The president selects the U.S. Supreme Court Justices. The candidates must be confirmed by the Senate. Why are the president's choices so important? Can George W. Bush run for the presidency again? If you were born in a foreign country and became a U.S. citizen, could you run for the presidency? Source: From How Individuals Begin Volunteering, by S. Helms, January 27, 2005, CIRCLE. Retrieved January 2005 from www.civicyouth.org/PopUps/FactSheets/FS_How_vol_began.pdf. What is the title of this chart? Rewrite it as a question. How many age groups is the survey broken down into? Under the column with the heading Method of Involvement, what is the difference between the first method and the next three listed? For people 26 and older, what was the most common way they first got into volunteering? What are the most common ways people age 16 to 18 get into volunteering? Which is the least common way that people get into volunteering for all groups? Step 1: Charts are used frequently in social studies texts, in magazines and newspapers, and on television to categorize information and make it easier to understand. This lesson will help you understand how to read a chart. Step 2: When reading any charts, look first at the main title, which is usually written in bold print. When you find the title, rewrite it as a question. This will tell you what information to look for in the chart. Step 3: Charts organize information in columns and rows. Columns are the rectangles that run vertically, or up and down, within the chart. Rows are the rectangles that run horizontally, or across, the chart. Step 4: Each category in a chart has a heading. Read each of the headings next so that you will know what information has been categorized for you. If you don't understand what a heading means, ask someone and look for clues in the chart. Step 5: Study the information under one heading at a time. Ask yourself what is important about this information. Does the information show amounts? Does it give descriptions or explanations? Does it give examples? Does it show order, such as largest to smallest? Look for a pattern to see how the information might be organized. Step 6: Sometimes you'll find small symbols by the information in a chart, such as an asterisk (*). These symbols indicate footnotes, which appear at the bottom of the chart. These footnotes give important information about the part of the chart where the symbol is placed. Step 7: Find the source of the chart. Where did this information come from? Can you trust the data you see in the chart? If you question the source, do further research. Choice 1: Pick something you know well, such as school, a sport, or a type of car, music, or clothing. Create a list of four categories for this topic. Then create a list of terms that fall under each category. Scramble the terms. Give the terms to others to see if they can figure out the main title and the headings and then draw a chart containing your information. Choice 2: Find a chart about a topic that interests you in a newspaper, magazine, or textbook other than your social studies text. Follow the Student Strategy steps to analyze the chart. Imagine you are going to explain to a younger student how to understand this chart. Rehearse your lesson. Then present the lesson to your classmates. Description: Abstract terms that describe government, religion, economics, society, and philosophy are often used in social studies and the media. This activity will help students learn and summarize the key characteristics of such essential concepts. Step 2: Tell students that this type of graphic, called a Frayer Model, is used to define abstract terms. Walk students through the model with the key word democracy. Step 4: Pass out a copy of the graphic organizer in Figure 6.19. Step 5: For practice, have students write the term capitalism in the middle of the graphic organizer and follow the directions in the Student Strategy section. Step 6: Instruct students to use these charts when they encounter difficult terms in their texts, including key terms in bold print. Also have students choose one of the Applying the Strategy activities for further practice and assessment. Students can use their texts or the Internet to gather information. Step 1: This lesson will help you learn how to understand and remember some of the difficult key words that you find in your social studies texts and that you see and hear in the media. Step 2: Key words in texts and in the media often describe an abstract concept. Remember that an “abstract” noun is a quality, feeling, idea, belief, or state of being. For example, pride, freedom, and Christianity are abstract nouns. Step 3: Look at the graphic organizer that your teacher has given you. This type of graphic organizer is called a Frayer Model. You will see a number of ways to describe an abstract key term. To fill in the upper-left box, you can look up the word in a dictionary or textbook and write that definition. To fill in the upper-right box, you can list characteristics of someone or something that represents this term. To fill in the lower boxes you can list examples and non-examples of this term. Non-examples are things that are of a similar nature but differ in some major way. A non-example of a summer sport would be snowboarding. Step 4: Once you are able to fill out the four squares, you can return to the upper-left square and write a definition of the key term in your own words. Step 5: For practice, write the word capitalism in the oval on your handout. Step 6: Look up the definition of this word in a dictionary or textbook and write it in the top of the upper-left square. Step 7: In pairs or PODs, fill out the remaining three squares. You may use your textbook or the Internet if it helps you. Always use a reliable source. Step 8: Now write a definition in your own words in the upper-left square. Choice 1: During the 20th century, countries whose governments promoted democracy and capitalism competed for world power with countries whose governments promoted communism. Do research to find out how pure “communism” is defined. Find out the characteristics of communism and which countries followed this political and economic system. Then fill out your graphic. Choice 2: The graphic you are using to define abstract concepts also works well with many concrete nouns that name people, places, or things. Try filling out the graphic with the word terrorist. Complete as much as you can before you go to a textbook or the Internet. Then use these sources to finish and check your work.